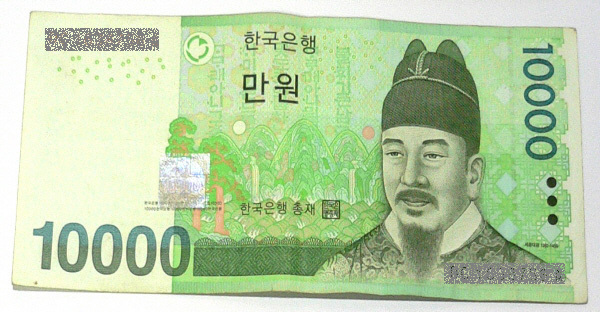 The Korean flag (태극기) is called “Taegeukgi” in Korean. Its design symbolizes the principles of the yin and yang in Oriental philosophy. The circle in the center of the Korean flag is divided into two equal parts. The upper red section represents the proactive cosmic forces of the yang. Conversely, the lower blue section represents the responsive cosmic forces of the yin. The two forces together embody the concepts of continual movement, balance and harmony that characterize the sphere of infinity. The circle is surrounded by four trigrams, one in each corner. Each trigram symbolizes one of the four universal elements: heaven ( ), earth ( ), fire ( ), and water ( ). 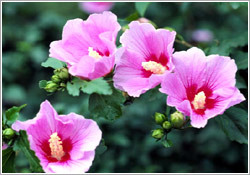 The national flower of Korea is the mugunghwa (무궁화), rose of sharon. Every year from July to October, a profusion of mugunghwa blossoms graces the entire country. Unlike most flowers, the mugunghwa is remarkably tenacious and able to withstand both blight and insects. 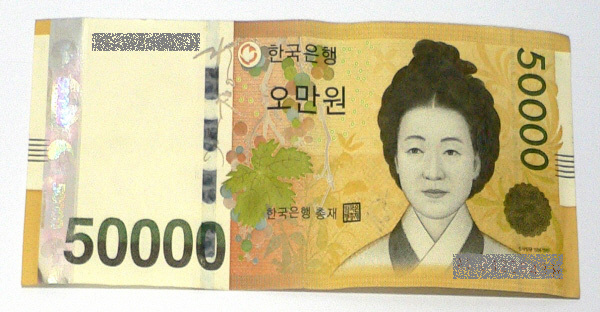 The flower’s symbolic significance stems from the Korean word mugung, meaning immortality. This word accurately reflects the enduring nature of Korean culture, and the determination and perseverance of the Korean people. 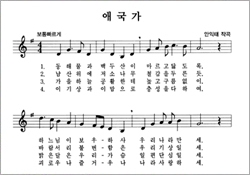 Korea’s national anthem is “Aegukga,” which means “Love the Country.” In 1896, the Dongnip Sinmun (Independence News) published various versions of lyrics for this song. It is not known exactly what music they were sung to in the early days. Records show that a Western-style military band was formed during the time of the Dae-han Empire (1897-1910) and that the “Dae-han Empire Aegukga” was composed in 1902 and played at important national functions. The original words of Aegukga appeared in written form around 1907 to inculcate allegiance to the nation and foster the spirit of independence as the country faced threats of foreign annexation. Over the years, the lyrics went through several versions until they were adopted as the national anthem in the present form in 1948. Map of KoreaThe Korean Peninsula is located in North-East Asia. 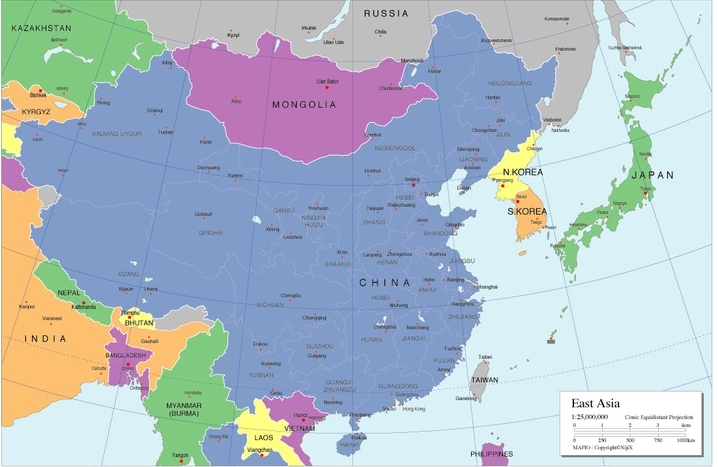 It is bordered by the Amnok River (Yalu River) to the northwest, separating Korea from China, and the Duman River (Tumen River) to the northeast which separates Korea from both China and Russia. The country itself is flanked by the Yellow Sea to its west and the East Sea to the east. There are several notable islands that surround the peninsula including Jejudo, Ulleungdo and Dokdo.The Korean peninsula is roughly 1,030 km (612 miles) long and 175 km (105 miles) wide at its narrowest point. Korea’s total land area is 100,033 sq km, and it has a population of 49.8 million people (2011). Because of its unique geographical location, Korea is a very valuable piece of land and an international hub of Asia. Mountains cover 70% of Korea’s land mass, making it one of the most mountainous regions in the world. The lifting and folding of Korea’s granite and limestone base create a breathtaking landscape of scenic hills and valleys. The mountain range that stretches along the length of the east coast falls steeply into the East Sea, while along the southern and western coasts, the mountains descend gradually to the coastal plains that produce the bulk of Korea’s agricultural crops, especially rice. 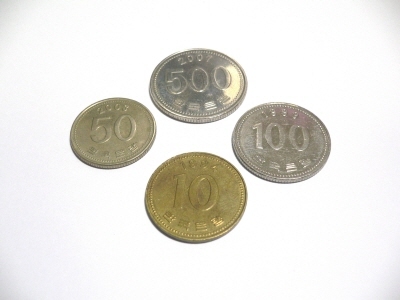 >500 won, 100 won, 10 won and 50 won.